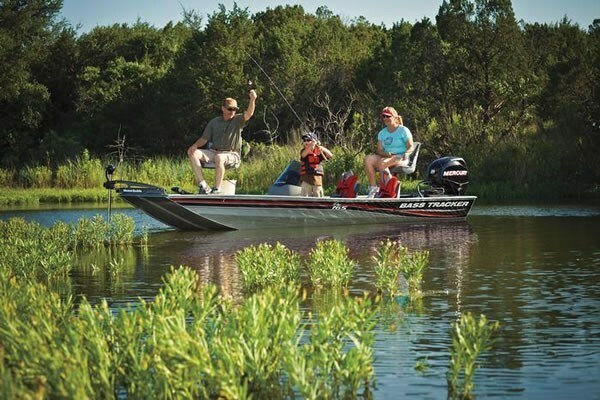 For thirty-one years, Tracker Marine, headquartered in Springfield, Missouri, has specialized in building freshwater fishing boats packaged with motor, trailer, and most of the basic equipment needed to head straight from the showroom to the nearest lake or river to immediately start fishing. A new model for 2011, the Pro 165 is one of six models from sixteen to nineteen feet in Tracker’s revamped line-up of Bass & Panfish Mod V models in which half are new for this year. All of these boats are of all-welded aluminum. The “Mod V” refers to the modified-vee, or flatter bottom design of this series as opposed to the deeper-vee design of the “Multi Species Deep V” series, or the almost flat bottoms of the Jon boats. True to Tracker tradition, even though the new Pro 165 is perhaps considered an entry level fishing boat, it is loaded with factory standard equipment and outstanding value. And just like its bigger, more expensive sisters, it is constructed of the same .100 gauge aluminum with all-welded, corner braced aluminum transom and full-length longitudinal stringer system with injected foam flotation for safety, extra rigidity, and sound deadening. Topsides, there is a remarkable amount of room to move around on the Pro 165 with its huge forward raised deck and aft raised casting platform, both of which extend virtually the full 6’5” beam. A fold-down pedestal fishing seat with pinchless hinges is provided on a new-for-2011 screw-in seat base on each of these platforms. In addition are fixed driver and passenger fold-down seats with a large storage compartment under the passenger seat. All seat frames are constructed from composite material. 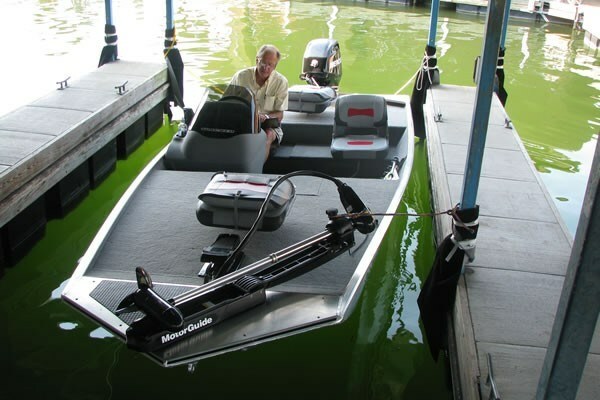 Additional storage lockers with all-aluminum, flush-mount, carpeted lids are also provided within both platforms and a 15 gallon (56.8 L) molded one-piece livewell with protecting rounded corners, bait bucket holder, and 500 GPH aerator pump with timer is found in the bow platform. Portside rod holders with organizer store up to four, 8-foot rods. Marine-grade, cut-pile carpeting is found throughout the boat. The driver’s side console is a one-piece molded design with tinted windscreen and houses the basic controls and switches you’ll need. Standard equipment includes a Lowrance® X50 DS fishfinder with surface temperature readout and swivel mount. A 12-volt trolling motor harness with receptacle powers the standard MotorGuide® 46-lb thrust, foot-controlled, bow mounted trolling motor. Both cranking and trolling batteries are supplied. Boatdealers.ca had some real fun with the Pro 165 out on the moderately choppy waters of Table Rock Lake, Missouri, home of Big Cedar Lodge, the huge and stunningly gorgeous resort owned by Tracker Marine founder, Johnny Morris. Spread over hundreds of acres and nestled into the surrounding hills and forests of the lake, this historic-type resort consists of mostly old fieldstone and log construction and highlighted with the most pristine landscaping. 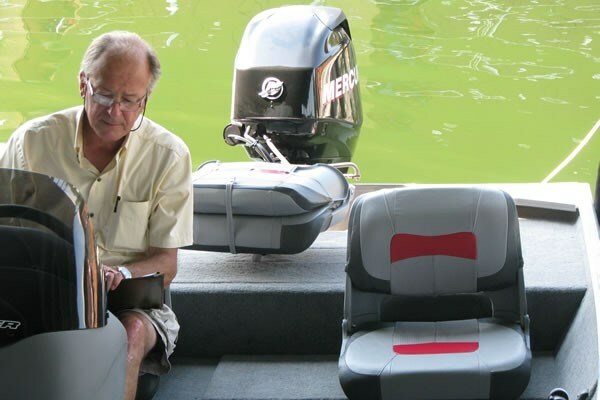 Standard power supplied with the Pro 165 is a Mercury 40 hp ELPT FourStroke EFI outboard. With the boat’s shallow modified-vee bottom, very little motor trim is required to obtain maximum performance and getting out of the hole onto plane is a breeze. But even with this seemingly modest horsepower, the Pro 165 scooted right along to a top speed of 34 mph with two full-size adults on board and a full tank of fuel. A comfortable cruising speed was an extremely economical 20 mph. This boat is fun. Sure it’s not as gentle on you in rough water as a full deep-vee would be, but the trade-off is its stability as a fishing platform when at rest or at trolling speeds. The Pro 165 comes packaged complete with a factory-matched, colour-coordinated, all-welded steel, powder-coated, swing-away tongue trailer. With this and all of the other standard equipment on board, it is literally a drive-away fishing and boating package packed with value and virtually everything you’d ever need to be enjoying your days on the water.